Looking for great personalized wedding gift or Bridesmaid gift? 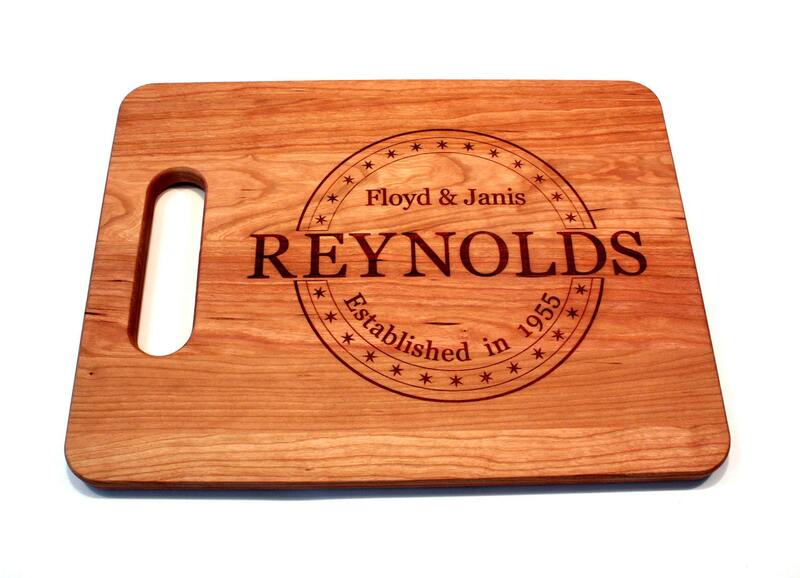 Our personalized cutting boards make a great handmade item for Wedding gifts, Bridal Shower Gifts, Housewarming gift, or just about any other gift giving occasion. Holding true to the original spirit of ETSY, we still make all of our cutting boards one board at a time using locally sourced hardwoods! Personalized wedding gifts are extremely popular. This personalized gift engraved handled cutting board is highlighted by a circular field of stars with your families last name engraved in the center as well as the couples first names and year of marriage. If the last name is 6 letters of less, see our other listing with the last name contained within the circle. It measures approximately 16″ by 12″ and is 3/4″ thick. The board features 1" radius corners and the edges have a 1/8" round over making it extremely comfortable to handle. The finish is 100% FDA approved as food safe. We use our own special blend of mineral oil, beeswax and carnuba wax to seal the board and give it a beautiful luster. Handmade by Tony Reynolds Designs in Granville, Ohio USA. It ships with care instructions in a nice white box suitable for gift giving and or wrapping. All of our cutting boards are made by special order, depending on order volume please allow up to 10 days for your board to be custom made from the time you place your order. We ship via USPS Priority Mail which typically arrives within 3 days of shipping. The cutting board was a gift and it turned out beautifully! I ordered it thinking it wouldn't make it in time because I was running behind, However to my pleasant surprise it made it before I expected it! I was so greatful and it was perfect!